Pescador and I rolled out early, as our host, Cristiano left for work around 5:15am. This gave us a good chance to log miles before the heat became too oppressive. The road is always a great place to observe the sunrise. 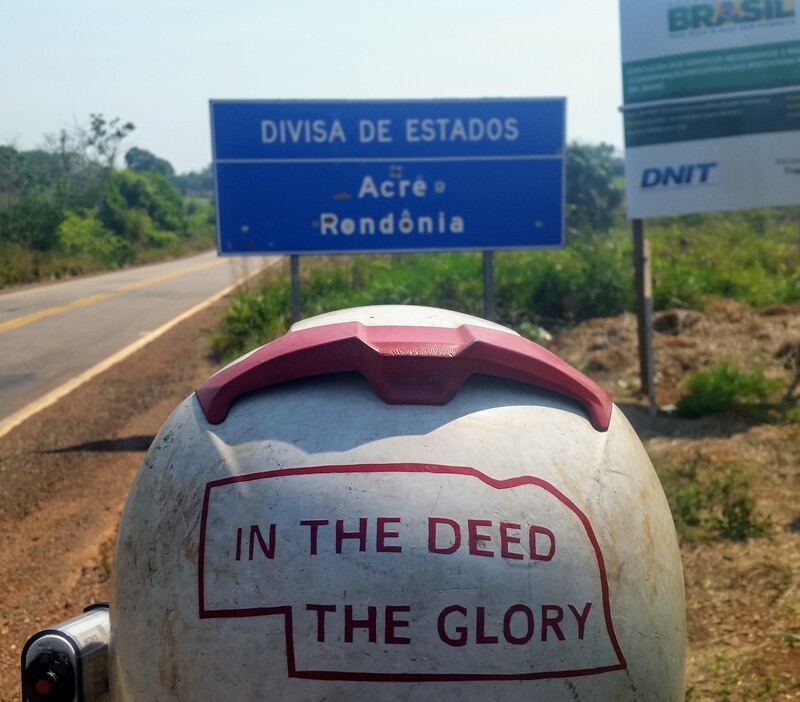 Our goal for the day was to reach Rio Branco in the state of Acre (pronounced “OCK-reh”), the final state in Brazil. 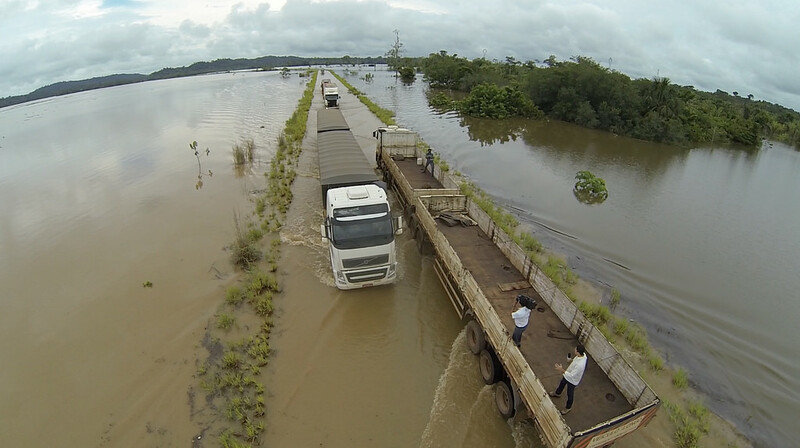 We would be spending all day on highway BR-364, also known as the Interoceanic Highway. This stretch is known for being a really rough, pock-marked section of road. Our day began on fairly smooth pavement, as we crossed over a huge floodplain. We had wonderful timing as we hit a one way construction zone just as it was time for the west-bound traffic to cross. The one way section lasted for miles, so it probably would have been at least a half hour wait if our timing wasn’t so favorable. 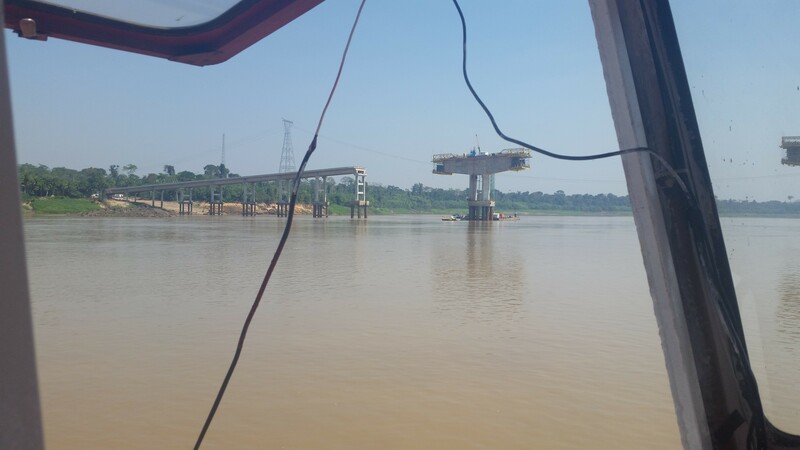 It was obvious that they were in the process of raising the whole road, bridges included. 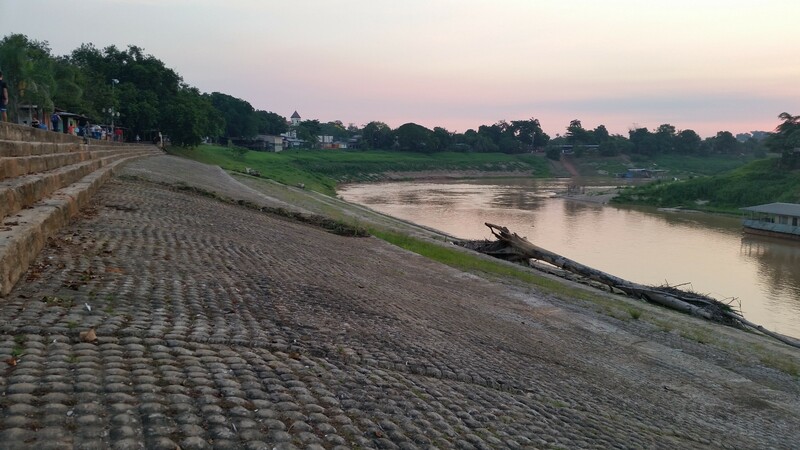 When we reached Rio Branco that evening, we found out that this road had actually been underwater a few years prior, when the mighty Madiera River had breached its banks. 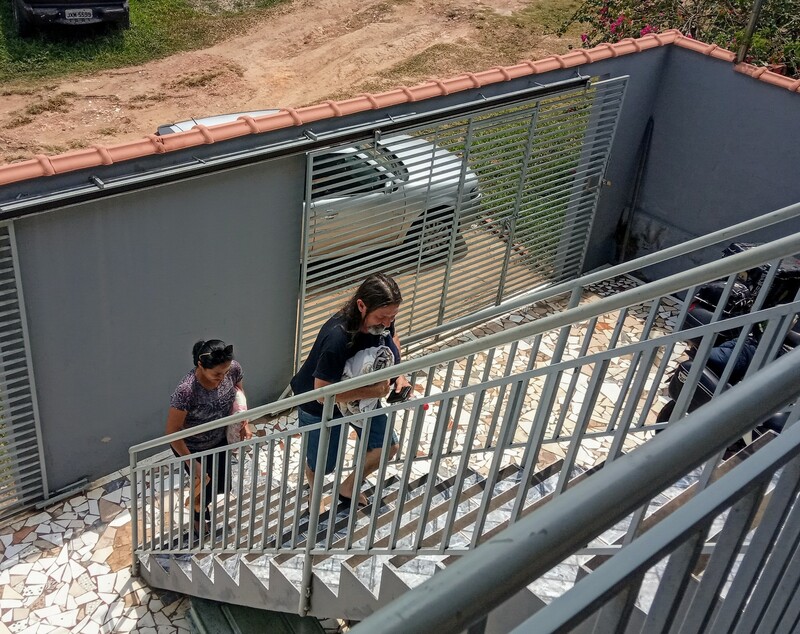 This meant that the state of Acre was completely cut off from Brazil for a few weeks. Though this road is in such a rural location, it is an absolutely vital link. 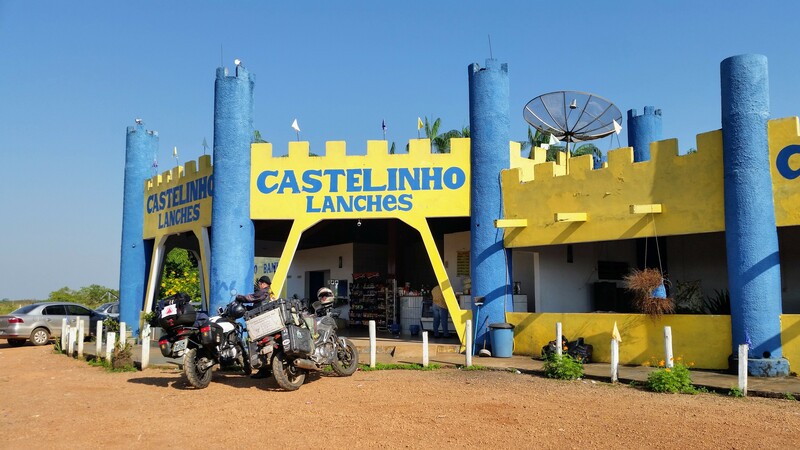 I haven’t eaten at White Castle on this trip, but have ordered a coffee at the “Castelinho” (little castle) in Rondonia. A little while later, I finally got to fulfill something that I’d missed out on the previous day: A boat trip on the Madiera River. They are in the process of building a bridge here and it remains the only section of road still missing on the Interoceanic Highway. The toll was about $2 for motorcycles. We loaded up and got ready for our ride. Pescador disappeared for a moment, then called for me from the edge of the ferry. From his tone, it was not possible to discern whether something terrible or something awesome was happening. Thankfully it was the latter. I don’t know how he did it, but he secured an invitation for us to ride in the cab of the ferry boat. 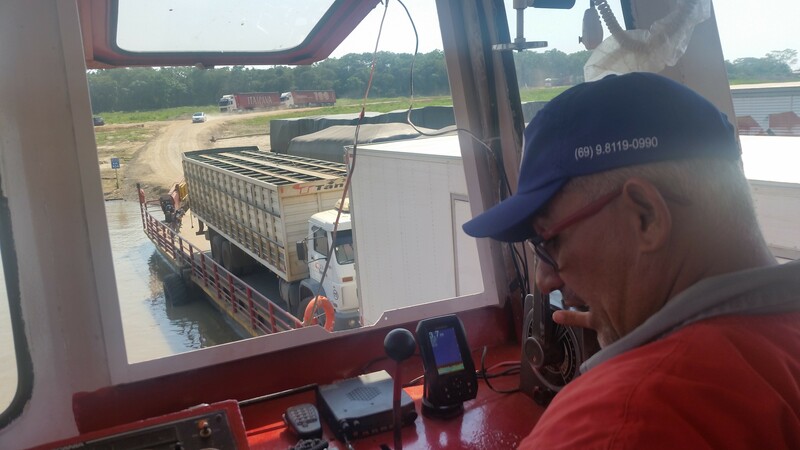 We had a nice time talking to the captain as he pushed the barge across the river. It was really impressive to watch him dock from his perspective. His margin of error was probably less than a foot, but he hit it dead center. The bridge is scheduled to be complete in a couple years, which will officially complete this coast to coast route. I was thankful that I got to have this unique experience. 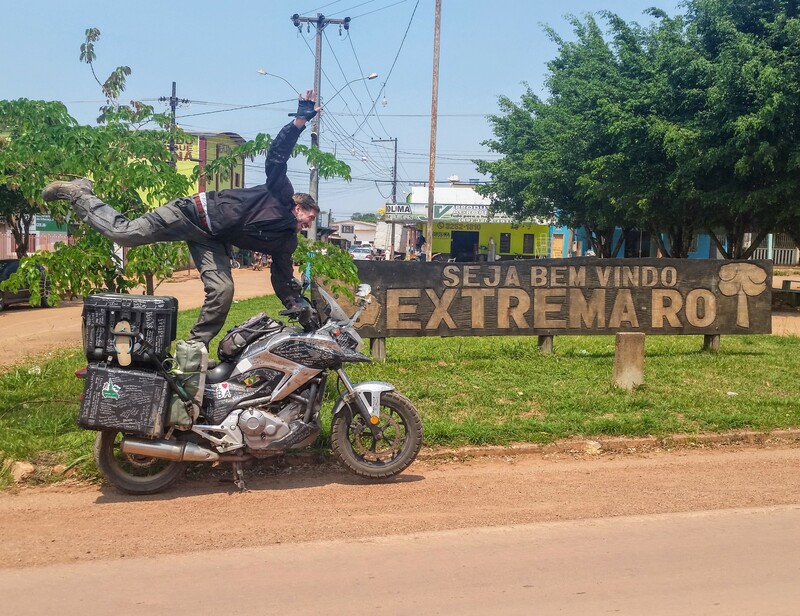 At the extreme end of Rondonia is a city called “Extrema.” Nobody is more Extrema than me! We stopped at an all you can eat buffet in Nova California. It was less than $4. After asking us where we were from, our server turned to Pescador, pointed at me and said very mater-of-factly, “He’s really white,” as if Pescador had yet to notice this. 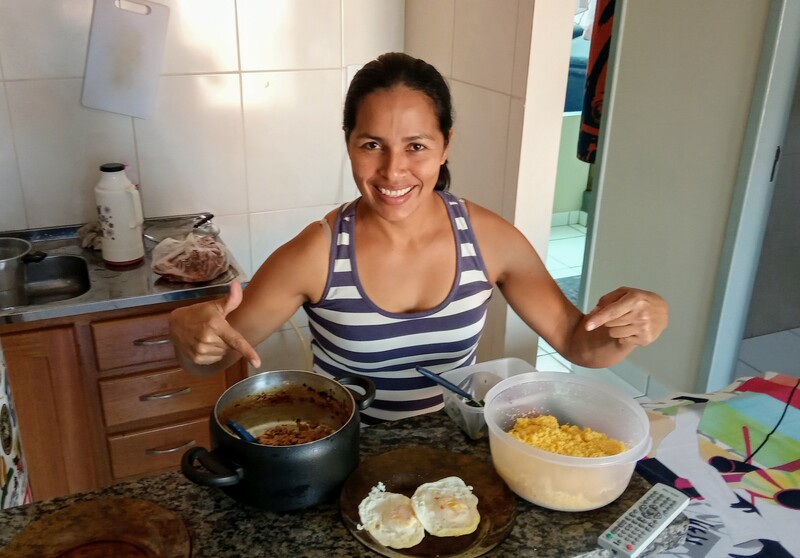 Brazil is so mixed, racially speaking, that this was the first comment on my ethnicity I had heard in awhile. The history of this little state, carved out of the dense jungle, is quite interesting. The region is rich in rubber, which was the main resource that attracted settlers here. Around 1900, Acreans fought successfully against Bolivia to become part of Brazil. 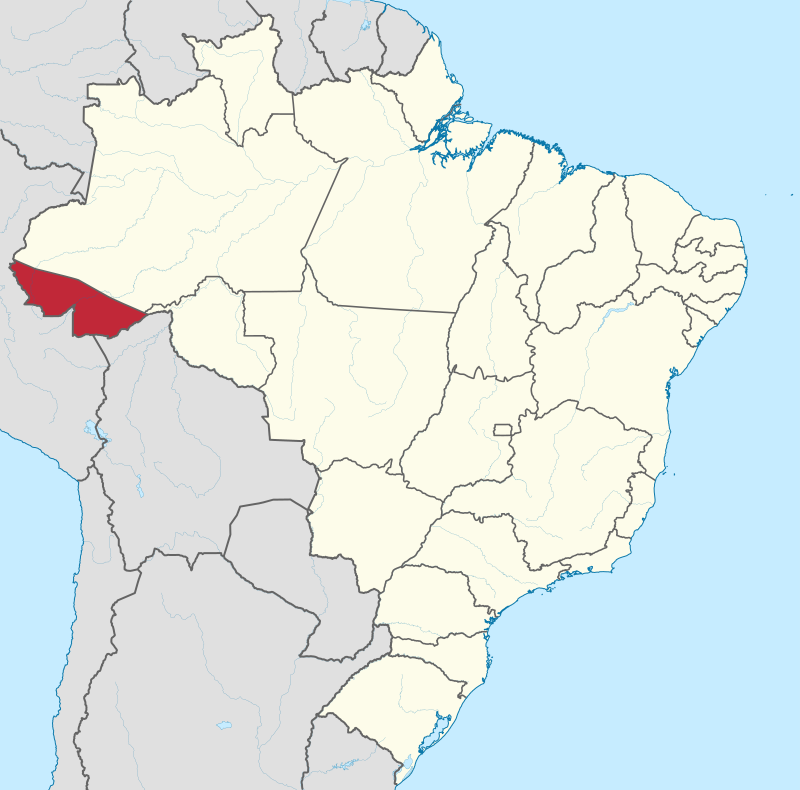 However, Brazil didn’t seem too eager to have Acre, only making it a state some 60 years later. Acre played an important part in the Allied effort during World War II. After the Japanese cut off rubber production in Southeast Asia, the US actually considered invading Brazil solely to capture its rubber resources. Thankfully, diplomacy prevailed. Even today, the common jibe is “Acre não existe” (Acre doesn’t exist). 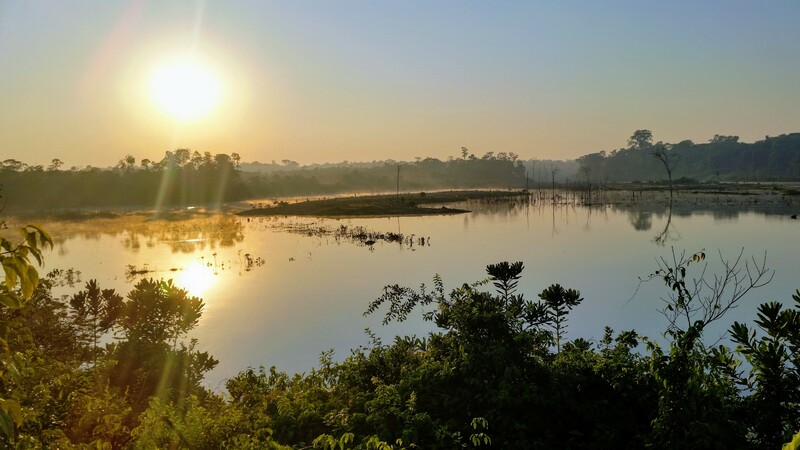 Very few Brazilians have ever visited this state. 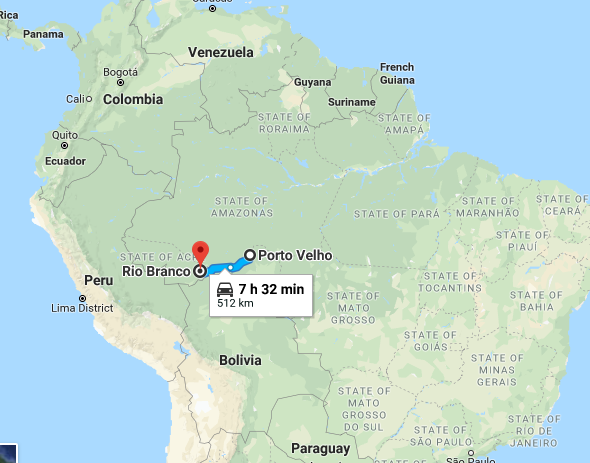 Indeed, it lies closer to Panama City than it does to Brazil’s largest city, São Paolo. I was eager to see what this little corner of the World was all about. Everyone had told us that the road gets really rough once this state is reached. I didn’t have much memory left on my camera, so I waited until it got really bad before taking video. ….unfortunately, I never pulled the trigger. There were lots of road crews working on this stretch. Though there were some pretty rough stretches, there were lots of parts which had either just been repaired or which had already been prepped for new pavement. I guess I will have to go back to get some more video footage. This is pretty much the only intersection in the state. 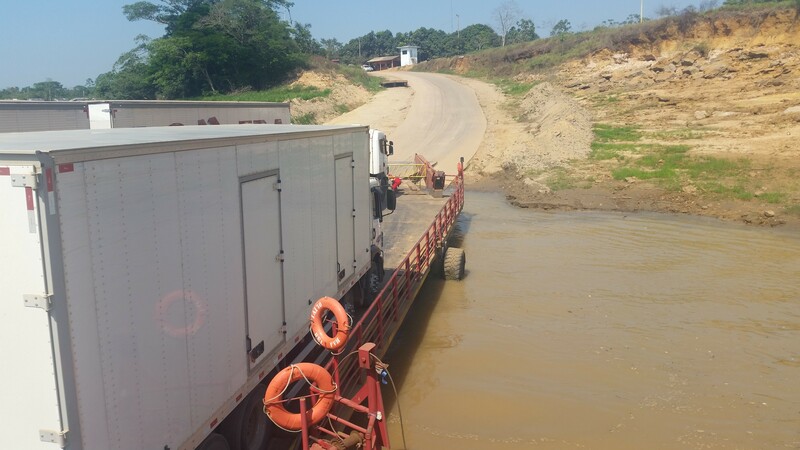 The Interoceanic Highway continues on into Peru, while these other two branches dead-end into the Amazon Jungle. 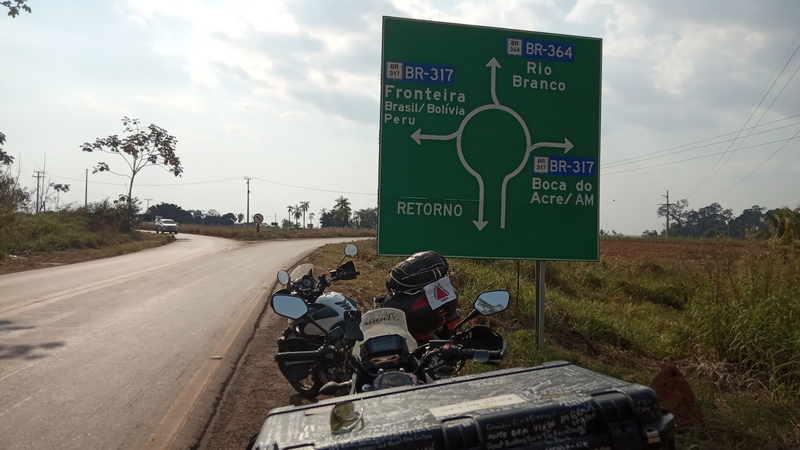 Around 4pm, Pescador and I reached the capital city of Rio Branco, which is home to around 320,000 people. 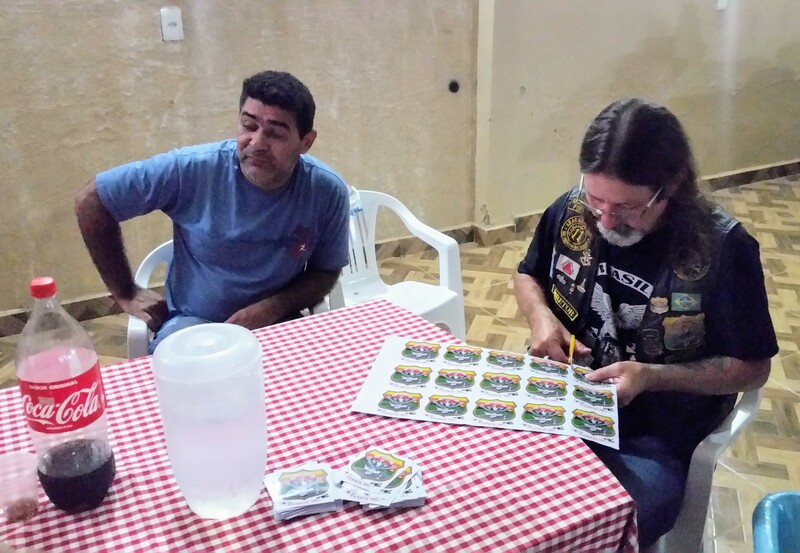 At this point, we were still thoroughly tangled in the web of Brazilian motorcycle hospitality. 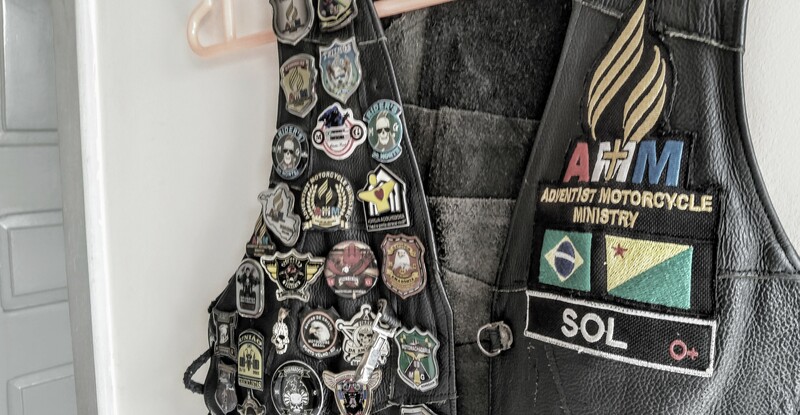 We were met by another member of the Adventist Motorcycle Ministry, Vanci, on his V-Strom. 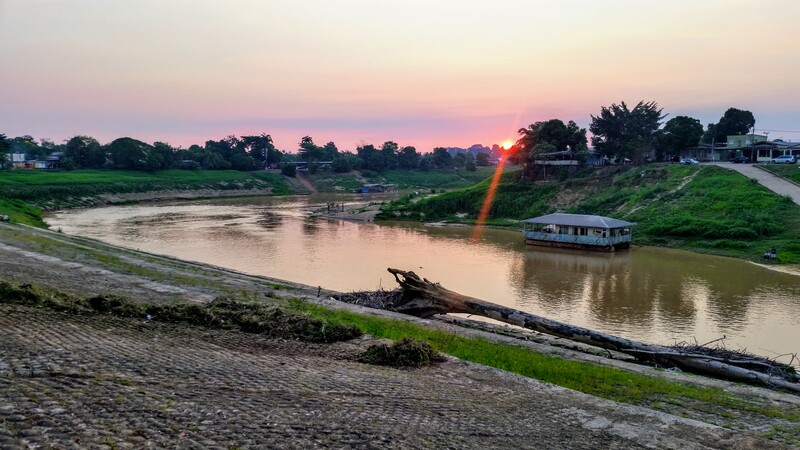 He took us around the city a little bit and we got to watch the sunset over the Acre River. This is as low as the river ever gets. During the floods a few years prior, it had nearly breached these high walls. They made us feel very welcome and fed us a nice supper. Joy of joys! A work day! Sol started me off with a great breakfast. Pescador had some errands to run so I had a day pretty much all to myself. Some solitude actually felt really nice. There wasn’t any wifi at the house, but I was so far behind that I still had plenty that I could do. I knocked out thousands of words and edited dozens of video clips. 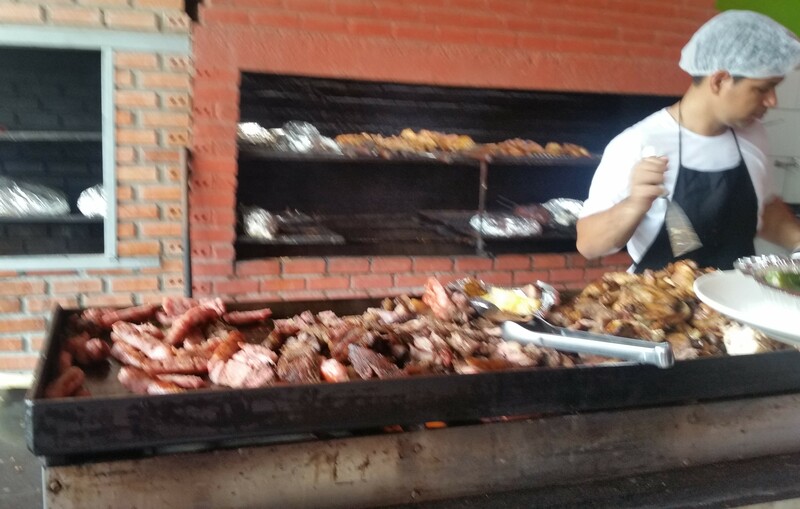 That evening, we all went over to Vanci’s for some churrasco. It was another really enjoyable evening. Pescador and I joked that we had about an 80% chance of attending some sort of party on the nights that we were together. ….and to think, people say my trunk is too big! 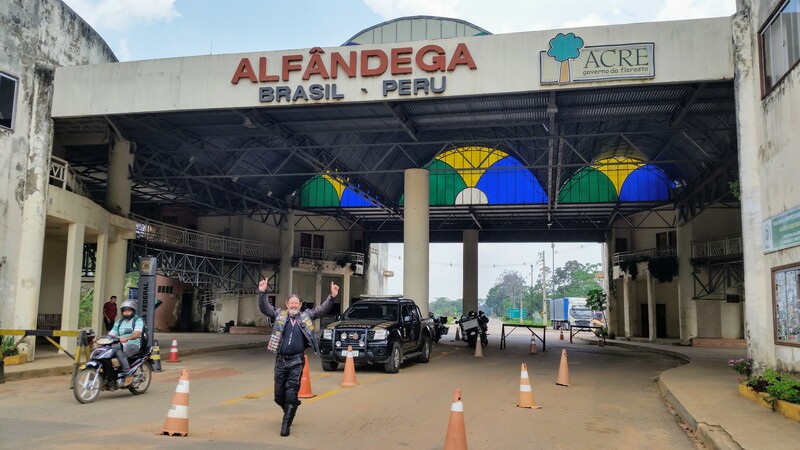 We had plans to get on the road early and make a break for the Peruvian border. For once, it wasn’t me that was having stomach problems. Pescador vomited multiple times in the morning, but still insisted that he was well enough to get on the road. Mamute, Sol and I all urged him to take it easy for the day, but he really wanted to get going. We were only on the road for about ten minutes when he pulled over, completely out of energy. 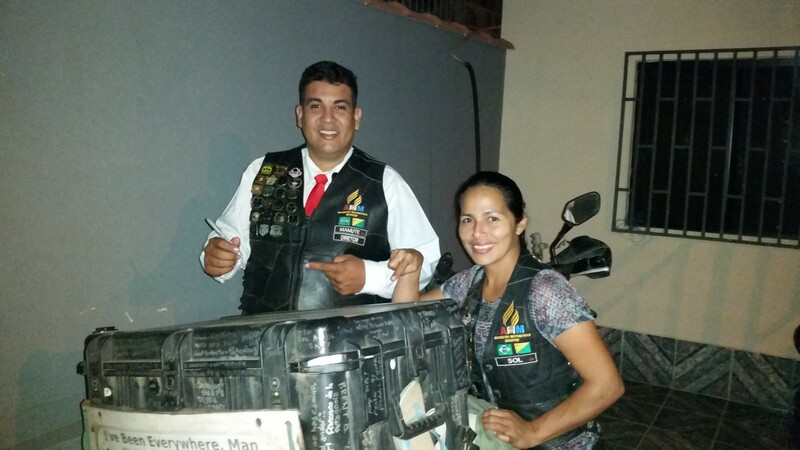 Mamute and Sol came to rescue us, then brought me back later so I could ride Pescador’s bike back to their place. I hadn’t ridden another motorcycle in a long time. These sorts of clips are really boring without Sonic in the frame, huh? He ended up going to the hospital and I had another day of getting a lot of work done. 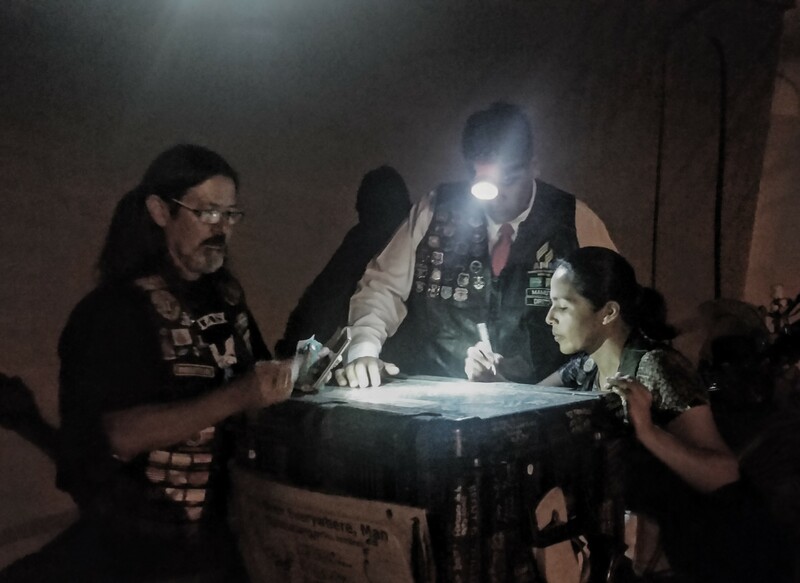 Pescador ended up staying the night in the hospital but returned triumphantly the next morning, saying he was in better condition than before his sickness. 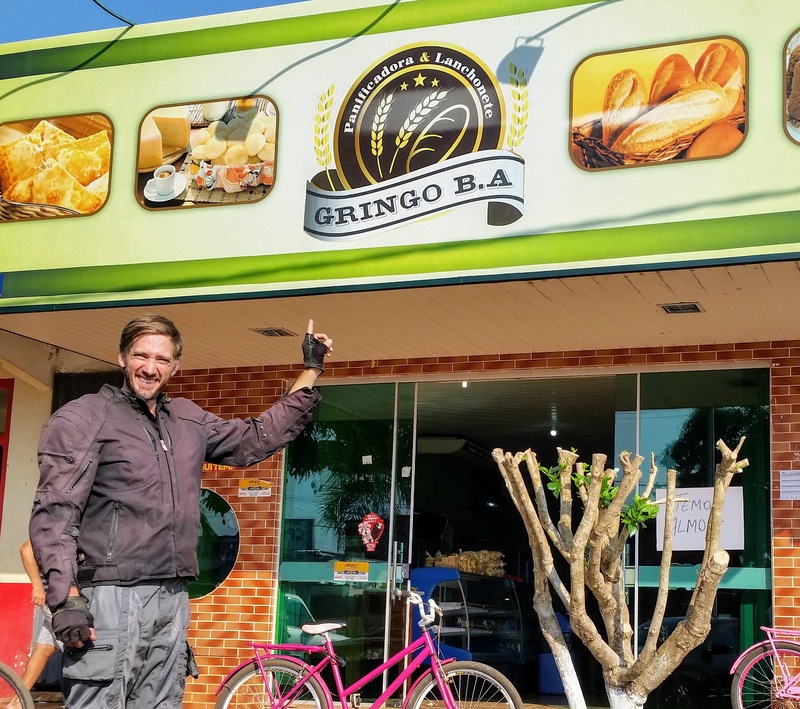 We went out for a nice, cheap, buffet meal and saw some more sights around Rio Branco. Despite being their guests for two days longer than anticipated, Mamute and Sol never seemed to demonstrate any fatigue in their hospitality. They seemed genuinely pleased to have us and share everything they had. 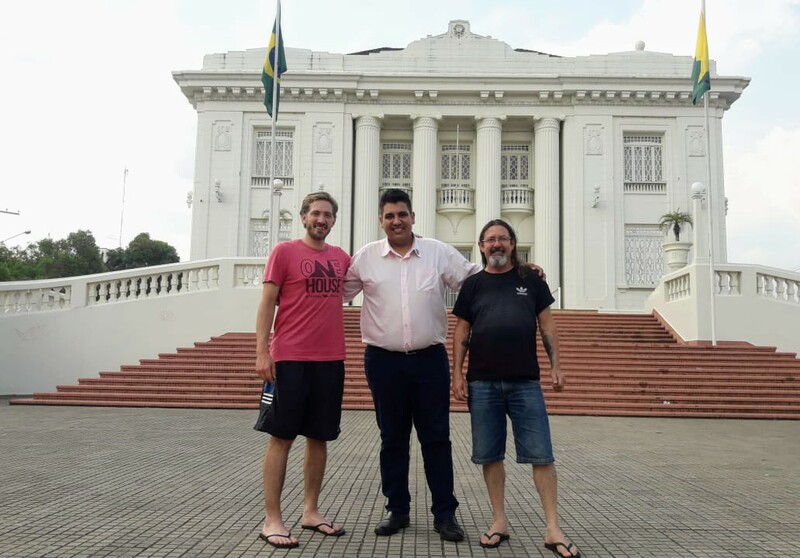 Even though we were at the very edge of this incredible country, these were some of the most “Brazilian” people that I ever met. Not only can I safely verify the existence of Acre, I can verify its benevolence and brilliance as well. 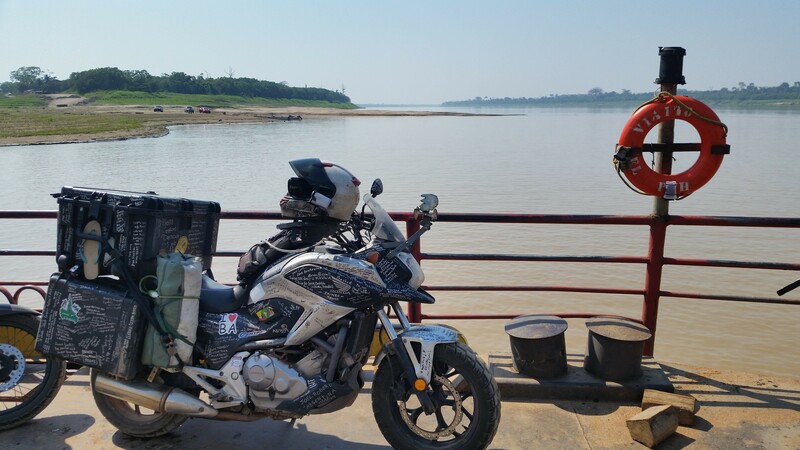 After two months in this incredible country, Pescador and I would be making the ride to the Peruvian border. I really felt like I connected with Mamute and Sol (despite it taking awhile to adjust to their accents), so it was tough to say goodbye to them. What wonderful people. Yes, the copyright infringement suit has been filed. I’m banking on that paying for my return shipping. 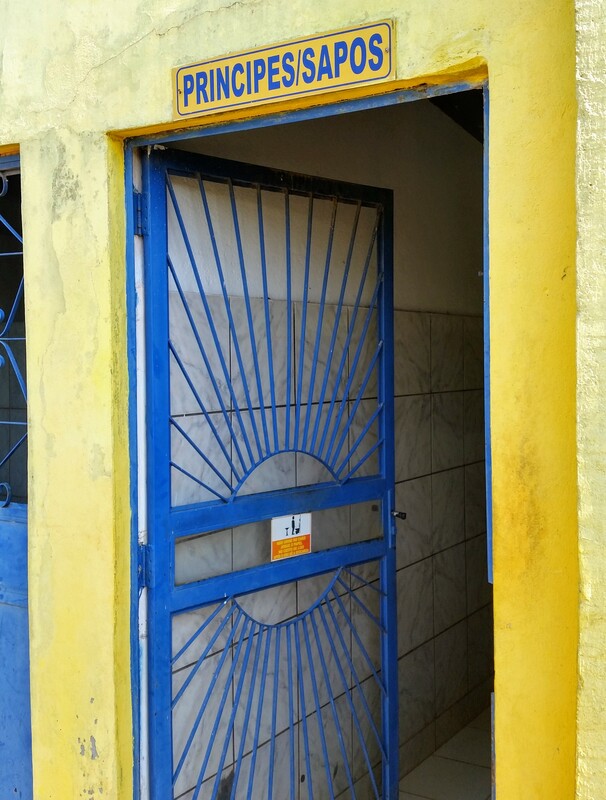 In the little town of Brasileia, I was within spitting distance of Bolivia for the third time (I can spit pretty far). I do sort of regret not visiting this country, but it just wasn’t in the budget, for time or money, this time. 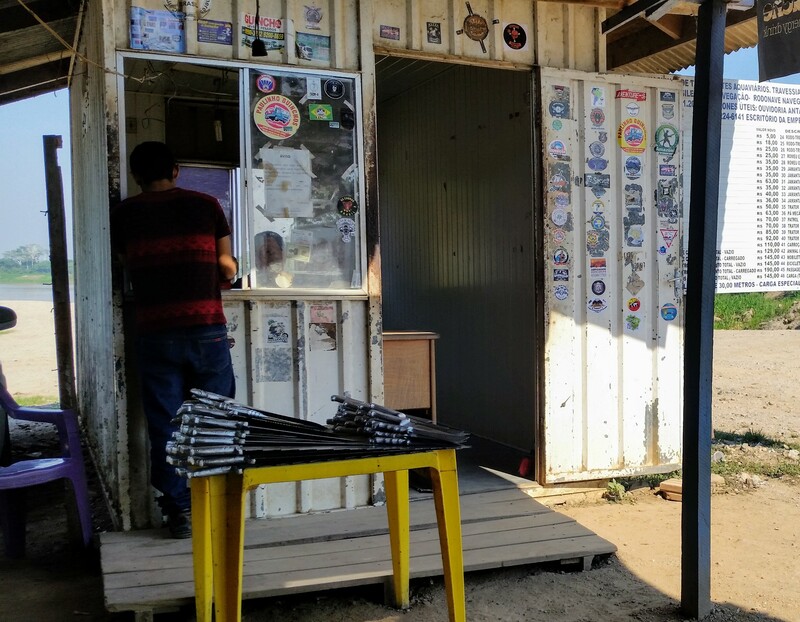 I’m still not sure whether Pescador enjoyed my company, or whether he just liked having a guy with a strong back and weak mind along to help him lift his bike for chain lubrications. The towns got smaller and more interesting. In one of them, it seemed like the Saturday activity for local youths was riding around in the backs of a pickup trucks drinking beer. I think they’d like Nebraska. 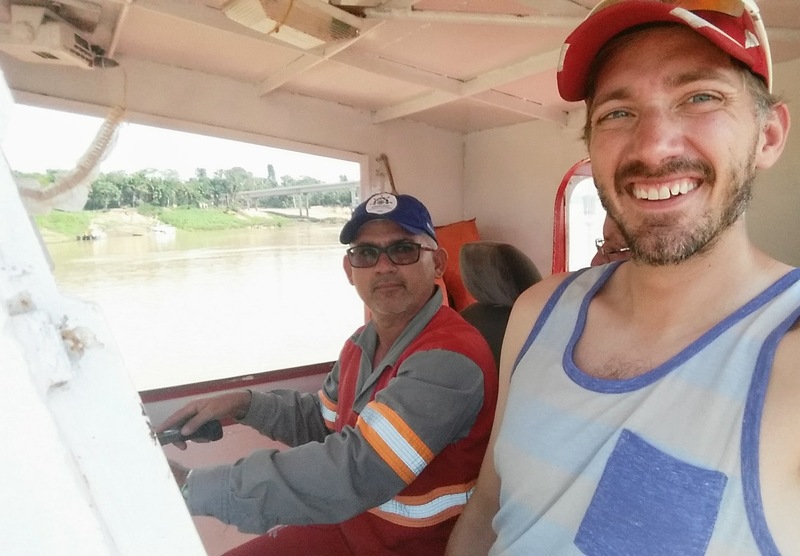 Around noon, Pescador and I reached the border. I have to admit, I was a little nervous as I went in to cancel my import permit. 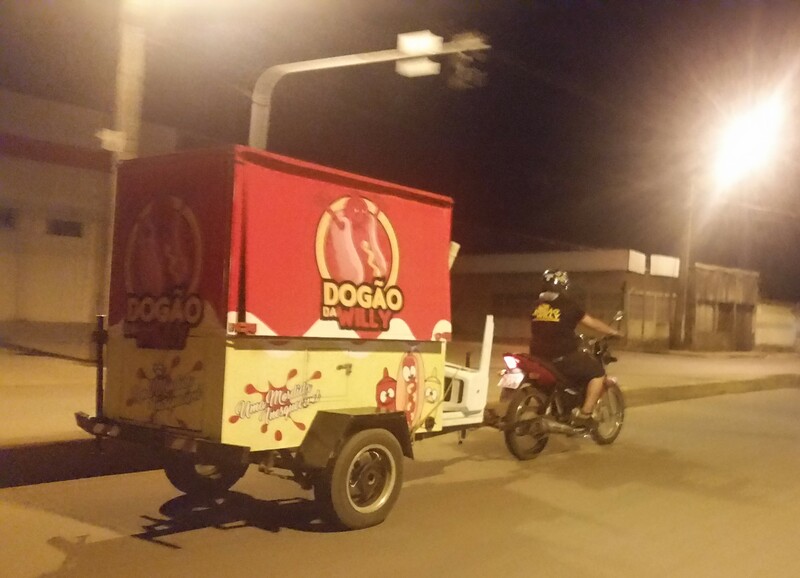 The roads of Brazil are absolutely packed with speed cameras. Judging by the furious brake stomping of locals, they work very well. 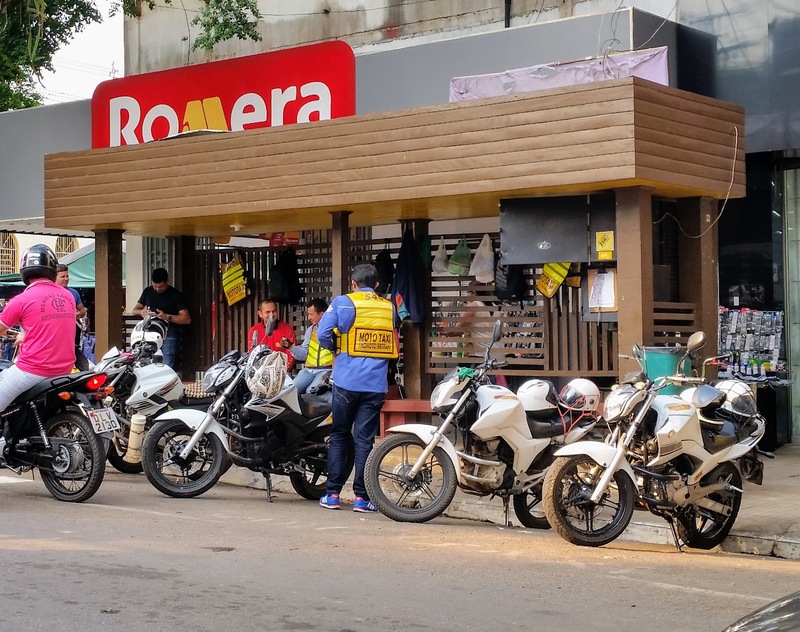 Brazilian motorcyclists even have their own hand signal to alert other riders to their presence. 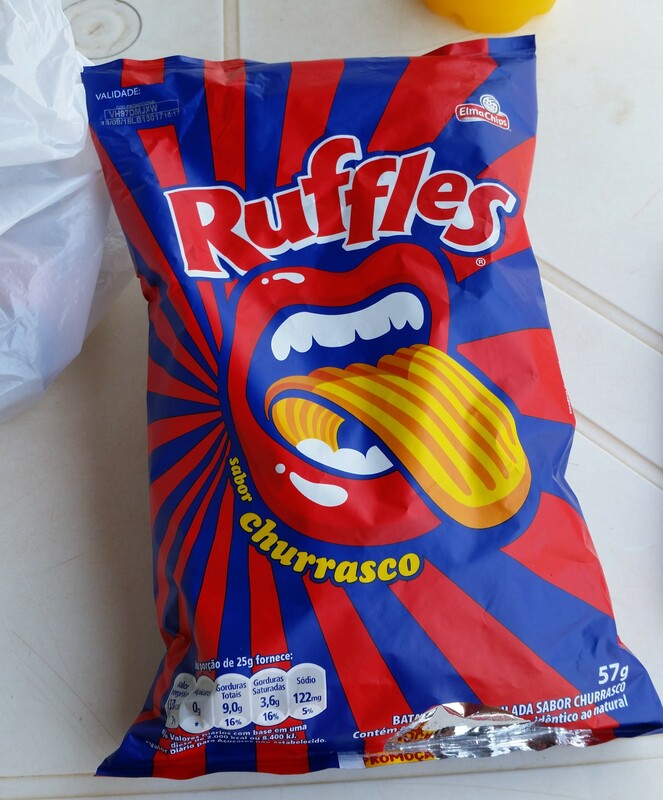 I’m sure I had sped through dozens of these during my time in Brazil, as they are often hard to see. I thought that I might be looking at a big fine when exiting the country. 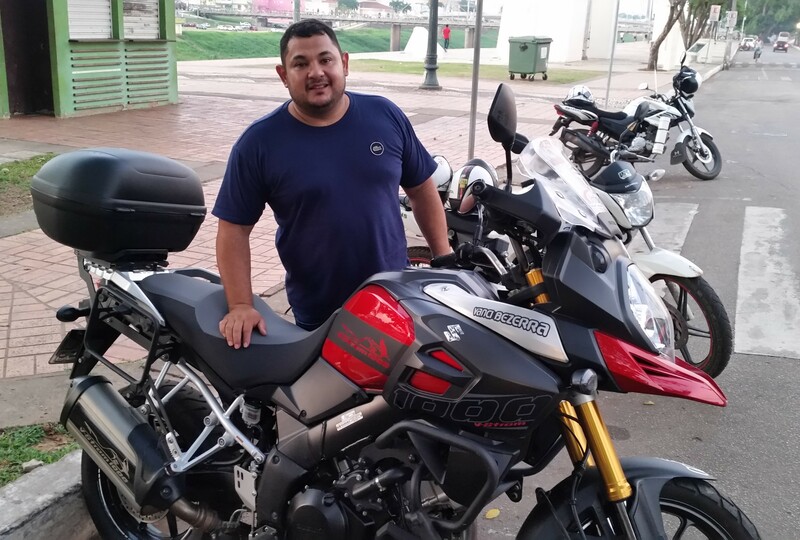 We met a really nice Ecuadorian rider who was entering Brazil…. …and I bid farewell to my green and yellow home away from home. What can I even begin to say about this country? I don’t even know where to start. 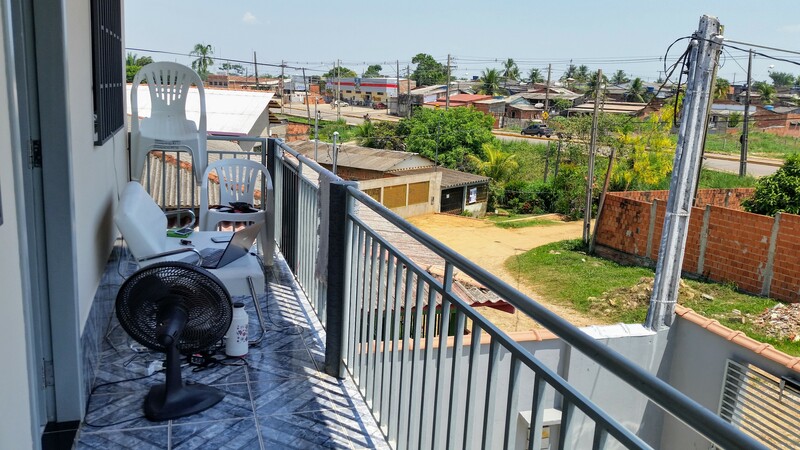 As I sat in Salvador, Bahia, on the other end of the country, I had no idea what to expect from my ride through Brazil’s interior. Reading those posts again, it sounds as if I really oversold the difficulty of this stretch. Though I was envisioning one man and one machine versus one jungle, that was not our story. 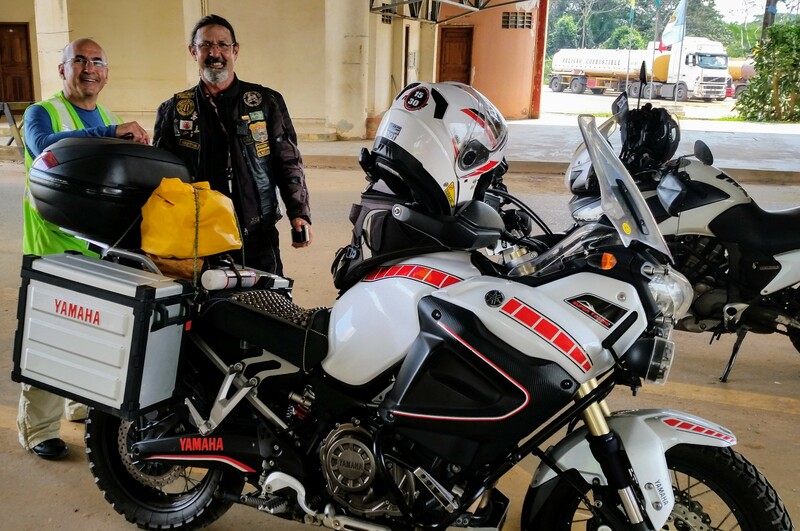 In this long inter-continental ride, I only spent four days riding by myself. 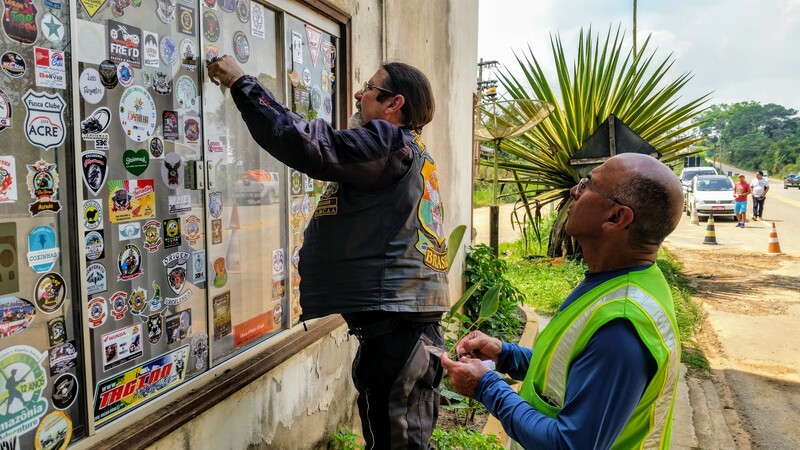 The company of Guidini and Farelo, Pescador and dozens of other riders was a constant encouragement. Let’s see if I can use some numbers to explain things. 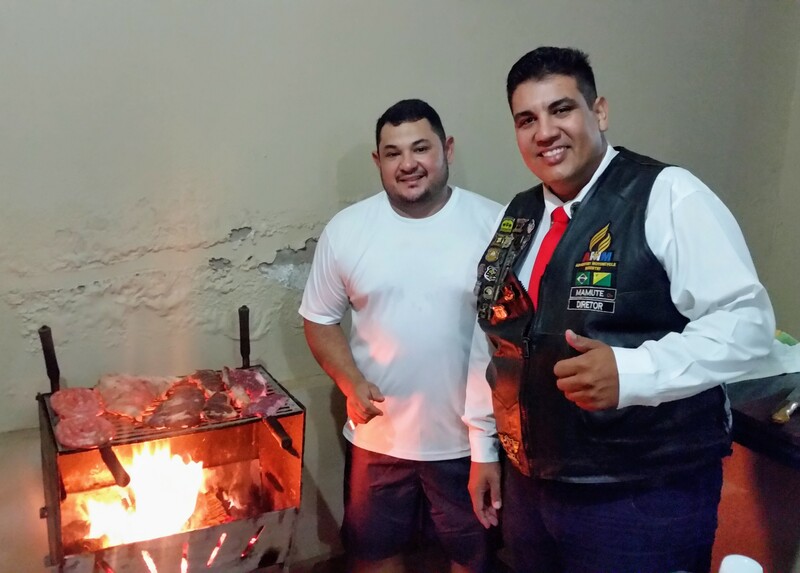 After being introduced to the Carcaras Motorcycle Club in Brasilia, I spent 16 more days in Brazil. During these 16 days, I spent a total of just $35 on food and just $40 on lodging. This is why I think the term “web of hospitality” is appropriate. 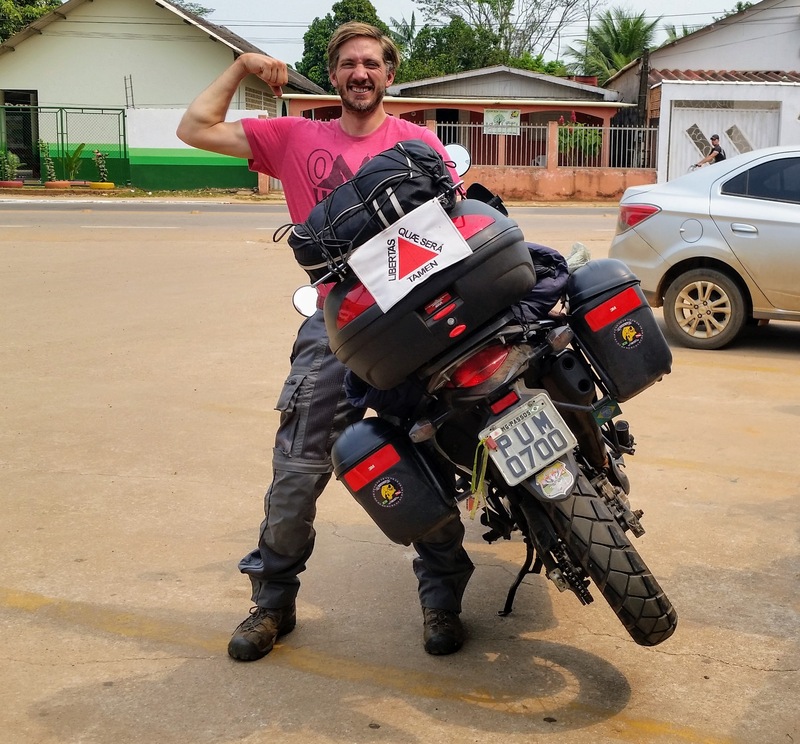 Though it may lack some of the mountainous switchback roads of other South American countries, I still think it is safe to say that Brazil is the best country for motorcycle travelers that I’ve ever visited. The way that they’ve developed such a vibrant culture surrounding their two wheeled conveyances is truly outstanding. I have no idea what my future holds, but it will be a monumental task to try to stay away from this country. Seriously, the web is sticky. 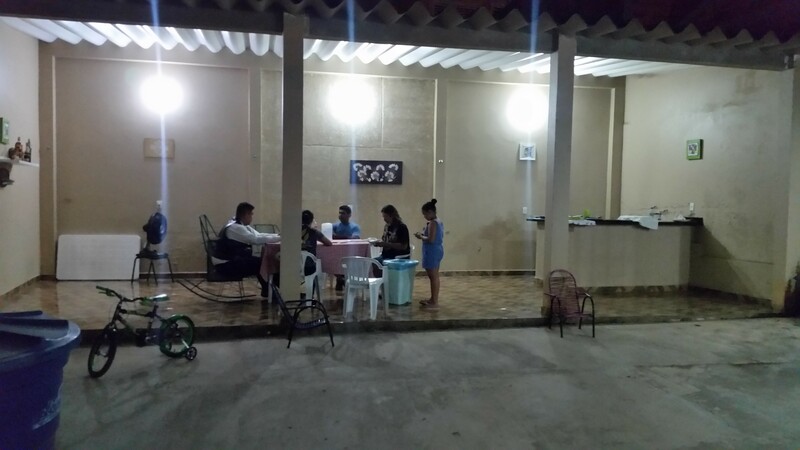 Realtime update: Still in Trujillo. I think I will stay just one more night, but the internet is really fast here so I could linger one extra. Yeah, you said it. That chapter could have been a lot different if I had been out on my own. Very informative post, Brett. Learned much about that area and a new word!! Keep up the great writing and photography! Love you! That’s why I spent all of that money on college: to learn big words! Love you too! If you go back to Brazil for a ride, I’d love to go with you… and from there, go into Bolivia.